Following Sunday’s postponement all tickets purchased will be valid for the re-fixture. Please retain and bring your ticket stub to the re-fixture to gain entry. (Details of re-fixture will be advised on Monday March 4th when confirmed by CCCC). Click below for full details of refunds. This game has been refixed for Sunday March 10th at 2pm in Wexford Park. Congratulations to Duiske College who claimed the South Leinster Junior ‘C’ hurling final recently. They now have a Leinster S/F to look forward to, with details TBC. Click below for full match report. 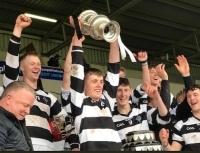 Completing a good weekend for Kilkenny hurling both St Kieran's College and Castlecomer Community School claimed victories in their respective Leinster Colleges Finals. St Kieran's College claimed the 'A' title on Sunday with a 1-17 to 2-7 win over Colaiste Eoin of Dublin. Both teams now enter the All-Ireland series, with St Kieran's College progressing to an All-Ireland semi-final and Colaiste Eoin heading to a qualifer. Castelcomer Community School claimed the Rest of Leinster 'B' title on Saturday at IT Carlow with a 3-14 to 3-12 win over Colaiste Choilm of Tullamore. Castlecomer now also progress to an Leinster Senior 'B' Final next weekend Vs St Benildus on Friday March 1st at 1.30pm in Hawkfield, Kildare GAA. Click below for a Castlecomer team picture. A large crowd was in attendance at the Kilkenny Supporters Club AGM held in Nowlan Park on Thursday night last. The meeting opened with a comprehensive report from Secretary Jim Freeman, this was followed by a report detailing the Club's accounts for the year. Chairman John Mackey then addressed the meeting detailing events of the past year and laying out plans for 2019. Click for full details. A club officer training night will be held in The Springhill Court Hotel on Monday 25th February at 7.30pm. This night is geared towards Chairpersons, Secretaries, Treasurers and PRO's and will be particularly beneficial to newly elected club officers. We would also encourage any vice chairperson or assistant secretaries and assistant treasurers to attend. Juvenile Secretaries and Chairpersons will also be welcome. Click below for more.